I decided to join Protect Our Breasts as a freshman because my sister Emily had been on the National Executive Board while I was still in high school. As soon as I got settled onto the UMass Amherst campus and adjusted to the new college life, I started to get involved with the organization. I began to research and understand the science behind breast cancer and the numerous endocrine-disrupting chemicals found in our everyday products that may contribute to a diagnosis of breast cancer later in life. I realized that yes; we really can make a difference. We can do something to change that horrifying statistic that 1 in 8 women get breast cancer in their lifetime. At Protect Our Breasts, we create relationships with industry leaders and travel to find safer alternatives to share with our peers just as my sister shared with me years before. Our friends and families can then influence the grocery store shelves by choosing to purchase safer products. This holiday season, we have launched the Protect Our Breasts first annual Empowerment Patron Membership Campaign. We are raising money to help fund our travels to change the grocery store shelves and to expand to more college campuses. We’ve been working hard to develop the tools and network with driven, powerful women at other schools so they too can share the conversation about everyday toxins that contribute to breast cancer. Please consider supporting our efforts through a tax deductible contribution by becoming an Empowerment Patron before the end of the year. This will allow us to continue sharing the conversation and help prevent breast cancer for our peers and future generations! 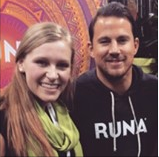 … And yes…it was amazing to meet Channing Tatum at the Runa booth at Expo West in Anaheim, CA last Spring! !